Includes cleaning, re-tubing, overhauls and repair of heat exchanges such as the TUBE SHELL, SPIRAL WRAPPED, OIL AND CHARGE AIR COOLERS. 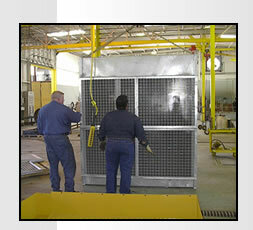 Capabilities to fabricate complete heat exchangers of various types. Provided in our well-equipped service facility and by our experienced and knowledgable associates. Service available for all types and sizes of radiators. Services include CLEANING, REPAIRING, REPLACEMENT of defective cores, or damaged sheet metal parts. Experienced field service team available to assist in radiator removal or installation in times of on-site maintenance or mission critical down-time.